The genius of Target inviting a retail competitor into its stores might not be apparent right away. After all, both sell many of the same consumer products from shampoo, gallons of milk, greeting cards, and prescription medicine. But just a moment of analysis shows this could well be the smartest deal in healthcare. Target is recovering from a failed expansion in to Canada and a high profile consumer data leak. These single-time events have hurt it financially, making it more difficult to expand via stores and online. Target’s CFO confirms this pharmacy business not quite covering its own costs. So it will receive $1.9 billion and annual rent of (20-25 million). All future Targets will be built with CVS Pharmacies and Minute Clinics built right in. So target is selling off a non-productive unit to finance growth. Better still, to the extent the pharmacy business was justified as a “loss leader” generating foot traffic, that will continue in every location, just without the financial loss and complexity of running that part of the store. CVS needs to do three things: grow its national footprint, build its service business (Minute Clinics), and provide value based on its scale and operational expertise. The deal will add 1,660 stores to its 7.800 points of presence, and add 80 clinics to count toward CVS’s goal of 1,500 Minute Clinics by 2017. And it will bring CVS in to new markets in Portland, Denver and Seattle. 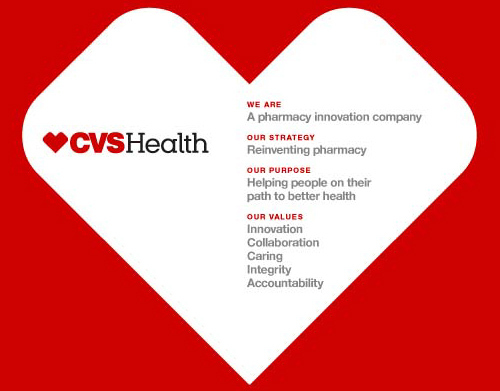 CVS is in a business which rewards scale, and combined with its other acquisitions this year it is positioned as a national health services platform, ready to do quite a bit more than retailing medicine. Target’s generalized “More For Your Money” promise sets its up as a general retailer best known for design at a discount. This positions them better to sell discount clothing and commodities than CVS. People don’t go to CVS for fashion, who go to target for health services. Consumers recognize that pharmacy and health services require a different set of skills and systems, and CVS has moved its brand to squarely center on the health business. Its Pharmacy business is profitable and accounts for 60% of revenues. Last October, CVS gained broad recognition for banning tobacco sales. CVS will provide a more credible pharmacy for consumers as they visit Target, which will allow both firms to focus on their core businesses, and customers to deal with two market leaders. There are huge benefits of scale in the pharmacy business. That’s why earlier this year, CVS purchased Omnicare for 12.8 billion. This provided a set of relationships to provide specialty high priced medications direct from manufacturers, and gaining Omnicare’s business as the leading provider of pharmacy services to long term care facilities. Prior to the Target deal, analyst firms such as Trefis, projected that CVS will fill one out of five prescriptions in the US in the next three years. This will provide a strong negotiating position toward suppliers. The incremental cost of extending CVS’s brand building and systems across a larger network — resulting in greater efficiency and market power for each dollar spent. The healthcare industry is typified by change, which is driven by drug discovery, service innovations – such as patients using mobile technology, and a set of regulatory reforms promoting transparency and population health. This deal gives CVS has gained access to 1,660 new retail points of presence to roll out new services and products as a major national retailer. Meanwhile, Target will be relieved of managing the complexity of changing relationships between health providers, payers, and a growing number of innovative new players in health care services. This will allow them to continue to build a vast e-commerce business to compliment their stores – and to innovate around price matching and creating greater integration between online and physical stores. In short, CVS needs scale to flourish, and Target needs to fuel growth after one-time events depleted their reserves. Both get what they need, along with the ability to focus more on the kind business they want to create for the future. Lucky or Smart – Will Healthcare.gov Turn Out To Be Either? 5 Responses to "Five Reasons the CVS / Target Deal is Smart Healthcare Business"
Thanks for sharing your thoughts on dave wieneke. gratis podrás ver recensiones y hasta capítulos enteros de obras comerciales. of survivalism than Brin’s work.